Been thinking about the problems that are being posed by China's stopping of buying recycled materials from other countries. This had been the primary market for a goodly part of the recyclable waste stream in many communities, especially on the West Coast. Also a major manufacturer of bottles using recycled glass is closing a plant in Massachusetts ("Milford glass bottle factory to close in spring," Milford Daily News) because of declining sales to "industrial" brewers of mass market beer, in the face of the rise of the craft beer sector. This is creating problems for the sales of recycled glass in New England. Glass is used in asphalt paving in Baltimore, or at least it was at one time, based on the pavement of streets near to Penn Station, which glisten and sparkle from the use of glass. "Glasphalt" enhanced asphalt can use up to 25% glass, depending on its size and whether it is used in the base or top coat ("Glass in asphalt gets another look," AsphaltPro). Roof shingles too can be used in asphalt production ("Using recycled asphalt shingles in asphalt pavements" Asphalt Magazine). Shingles make up about 8% of construction waste. They would require extra processing to remove nails and other detritus, but that creates jobs. The asphalt plant in DC is on industrial zoned land along the Metropolitan Branch railroad and subway tracks. 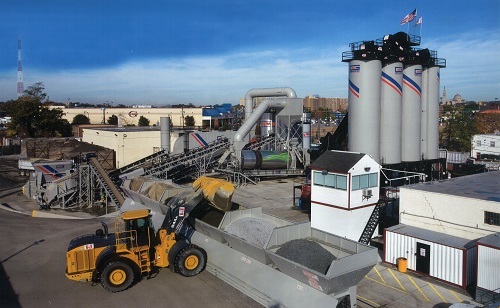 In cities with frequent repaving and with asphalt plants located within the community (e.g., in DC the asphalt plant along the Metropolitan Branch Trail is always busy), why not boost solid waste reduction and markets for recyclables by using glass and/or shingles as part of the feedstock for asphalt paving? It would also be a way for the local transportation research program between Howard University and the DC Department of Transportation to do a wider range of projects. For example, I learned about shingles as a potential pavement material from the publications I get from the transportation research center at the University of Minnesota, which also runs the Local Transportation Technical Assistance Program for the state and the various county, city, and town transportation agencies.